Clark and Perry walk in Centennial Park, Perry noticing that Clark looks troubled.�Clark tells Perry that it is hard pretending that he has been fired and disgraced from the Planet while he is really working underground against Luthor.�More than anything, Clark is sick of lying to Lois.�Clark sputters around the problem, but Perry just tells him to spit it out. Clark recalls the previous day.�As Lois and Clark got ready for the day, Lois tries to convince him to stay home and not go job hunting.�Clark tells her that he has to go, and heads out the door. Across town, John and Natasha talk about the injuries he sustained from Manchester Black as she runs a diagnostic on her uncle.�His brain has been strained too much, and putting on the Steel armor again would probably kill him.�John walks away from her, muttering that Black hurt him once before and the Entropy Aegis saved him then.�Perhaps he was meant to wear the armor. As Clark walked across town, Lois quietly followed him.�He should have been able to detect her, but he got lazy.�She followed him into an old condemned warehouse where he had set up shop for his investigation into Luthor.�Following Clark to a back room, Lois wonders what is in it when suddenly he is forced to leave on an emergency. 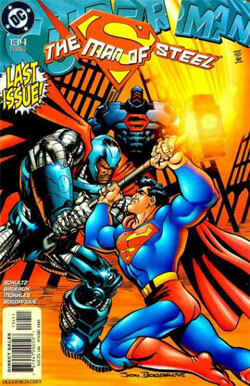 Superman soars across town to the Steelworks, where Natasha frantically asks for his help.�There John Henry stands, wearing the Aegis and holding onto Pat's fist.�Superman quickly pulls Pat away and tries to reason with the corrupted hero.�Steel struggles for a moment and then explodes in a fury, declaring himself the Aegis and forcing Superman back with a burst of energy. Superman and Steel grapple for a moment, before John declares himself Imperiex reborn.�Suddenly, Natasha fires an energy beam between the two of them, forcing Steel to back away from Superman.�In his delirium, John raises an arm and sends a bolt of energy flying toward Natasha.�At the last instant, Superman dives in front of the teenager, intercepting the beam and saving Natasha from certain death. Superman looks on in amazement that his friend could turn on his own family.�Steel approaches and finally removes the helmet.�With his eyes glowing an unnatural red, he tells them that he can no longer remain on Earth.�His master is calling him home.�Rising into the sky, a sphere of energy surrounds him and in the next instant, he is gone. Returning to his makeshift office, Clark finds his wife standing there, looking in disbelief at the hundreds of pictures and notes hanging on the walls.�Clark asks why she tailed him and she responds that she knew something wasn't right.�She asks why he is so obsessed with Luthor, why he insists on doing this.�Clark tells her that Luthor took Clark away from him, and he needs to prove it to the world. Clark tells Perry that he developed a new system for organizing notes so that no one else would understand them.�Lois definitely would not have seen anything substantial there.�Perry apologizes for doing this to Clark, but then tells him that it must be done.�Clark tells Perry that there is a difference between a secret and a lie, and he fears that the price of one may be much worse. In their apartment, Lois calls Martha Kent.�She struggles for a moment, and then tells Martha that she thinks that Superman is losing Clark Kent. Superman flies across town to find Nat cleaning up the damage in the Steelworks.�He apologizes to her for bringing John back from the moon in the first place.�He had died there and he should have let him rest there.�Nat says that his test results were scary.�The attack from Black should have killed Steel, but his link with the Aegis kept him alive.�Superman tells her that her uncle was really someone special, and Superman would not be alive today if it was not for him. Superman asks her what she is going to do, and she tells him that she will continue on her uncle's work there.�Superman tells her no matter what she does; she should make her life count for something, and make the world a better place. Story - 4: I found a lot of good things contained in this issue.�Mainly, it deals with a lot of plot lines that have just been dangling.�Clark has been working underground for months now and Lois never suspected a thing?�Finally we see some fallout from that.�Granted, I am not the biggest fan of him keeping this from Lois (what would telling his wife ruin, she can keep his identity a secret so I think she could handle this) but I really can't judge one issue on a whole plotline so I will ignore that.�John's injuries are finally dealt with, as well as the Aegis.�Plus this leads into the Apokolips Now book (don't you think they could have been more creative with the title?) that I am very much looking forward to.�I did not like the idea of Superman losing Clark.�We have seen this sort of thing before, and time and time again (post-crisis anyway) Superman has specified that he is a man, and that Superman is just a costume.�I don't see why Clark researching Luthor means he is fading away.�I am sure I will get plenty of people that disagree with me here, but it just seemed kind of weak.�Regardless, that is my only gripe with the issue.�I enjoyed it very much and will be very sorry to see Mark Schultz go.�His writing brought a sense of scientific fact to the books that I enjoyed very much.�Hopefully we will see his work again. Art - 4: I enjoyed the art of the issue as well.�Except for the gratuitous use of splash pages (the first one worked for me but the one of Superman saving Nat was just excessive) the art was nice and dynamic, with Steel looking great in the Aegis, and Superman looking pretty good as well.�The fight between Superman and the Aegis was well done, with something more than just your standard punches being thrown.�I didn't really like the way Lois looked, but that's just a personal opinion.�I also really liked the last pages being done by Bog.�I may not be a big fan of his art, but having him return to close the book he started long ago was a very nice touch.�His style has definitely changed over the last decade though.�Overall, good dynamics art with a few minor problems that don't really detract from the book at all. Cover Art - 4: A nice cover.�It has somewhat of a background, and the Superman/Steel fight is the central focus as it should be.�I am torn on whether or not Steel should have been in the Aegis instead of his armor, and I cannot come to a decision so I will leave it at that.�I like that the logo is being shattered by Steel's hammer, a technique that I feel is not used enough on covers.�I'm glad that Bog did the cover, but I also have my problems with his art as always.�Their faces don't look great, and Superman's arms seem out of proportion.�Overlooking that, it is a nice solid cover, and as I feel Jon definitely should have done the last cover, I don't think it could have been a better one. And with that, we return to three books a month.�I didn't start collecting until after MOS had started, so I have never gone without a weekly Superman comic.�I guess I'll see how I like it.�Thanks to everyone who contributed to the last 134 issues, from Louise Simonsen and Jon Bogdanove to Mark Schultz and his crew, it was a fun ride.